Where Art And Science Meet, Exactly : 13.7: Cosmos And Culture One of the great ironies of human existence is that art and science are both optional costs for culture. The intersection of art and science gets a lot of ink these days, for good reason. Art can help us relate to and understand science. In a culture saturated with the fruits and poisons of science, we often struggle to understand its meaning for us. This problem is compounded by the fact that we are often told that science and technology are devoid of meaning. While I think such claims are highly suspicious, few would argue that art is devoid of meaning. Very often it's through art (dance, poetry, painting, sculpture, etc.) that we get to explore the half-recognized relationship between ourselves and the world we inhabit. We often discover meaning through art. There are deep connections between meaning-making and object-making. Those connections are exactly where the resonances between art and science find their potency. Last week, on a trip to the sprawling beast that is Los Angeles, I received a first-hand lesson in the powerful relationship between art and science. As a native of New York's metropolitan grime-hive, I was slow to warm to L.A. All that sand, all that sun and those mountain vistas seemed too pleasant. My conception of a "real city" couldn't accomodate the lovely window dressing that frames Los Angeles. I was also convinced a place like this could not foster genuine and serious artistic effort. An afternoon's trip to the astonishing Getty Center cured me of that bias. Pacific Standard Time: Art in LA 1945-1980 is a series of exhibits that have been running across the city for a year. Exploring the movements that helped turn L.A. into a center of post-war culture, the exhibits at the Getty Center opened my eyes to artists I had never seen or was only dimly aware of. It was in one of those galleries that I discovered the work of De Wain Valentine and came face-to-face with the intersection of art and science. Born in Colorado, Valentine's early experiences with polishing rocks awakened his sensitivity to "reflective surfaces, translucence, and industrial processes." On moving to L.A., the seemingly endless sea and skyscapes of Southern California pushed him into pioneering work with resins and industrial plastics as he sought to create sculptures that played with the region's marvelous light. Out of necessity he developed his own a modified polyester resin called MasKast, allowing him to produce monumental objects in a single pour. What he created with his new process was nothing short of monumental. The Getty Conservation Institute's exhibit From Start to Finish: De Wain Valentine's Gray Column (runs through March 11, 2012) details the creation of one twelve-foot high, eight-foot wide, 3,500 lb. 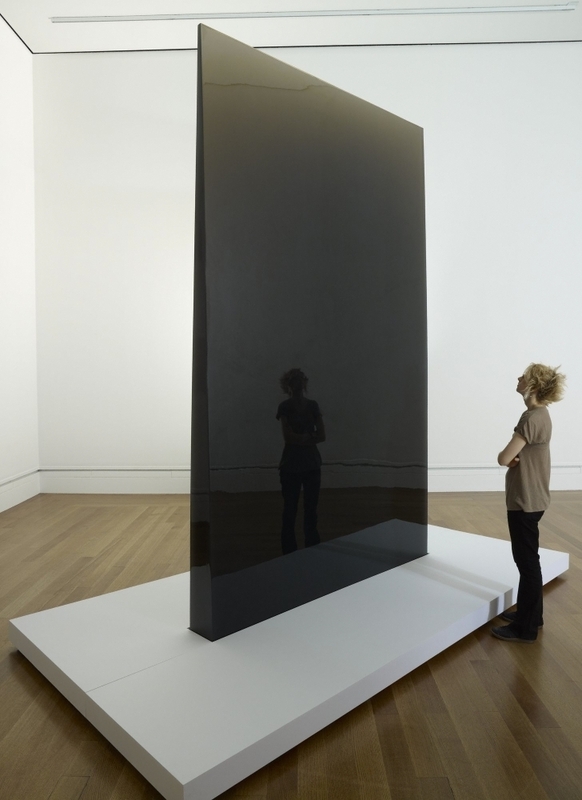 work with the appearance of a gigantic burnished prism. Taking in the "Gray Column" from all angles of the gallery, it's clear that Valentine's work is, essentially, a protracted experiment in the relationship between light and matter. As the artist once said, his goal was to "take a big saw and cut out a piece of sky." This goal was a reaction to outrageous beauty of Southern California's natural gifts. To move from that inspiration to creation, from that idea to matter, however, Valentine needed to engage with the world at the level of resin chemistry. The Getty's exhibit details how he struggled to get barrel after barrel of the resin into wooden frames without the frames bursting into flame. (The liquid resin released enormous amounts of heat as it changed phase, setting into a solid form.) In reading of these efforts I was struck by the similarity of process in art and science. De Wain Valentine's work clearly lived at the frontiers of the chemical industry's understanding of resin polymers. That does not, however make him unique. Even with the role chemistry played in art there is not a foundational difference between Valentine's efforts and other artists. Every painter experiments with the colors they can, or cannot, create from tubes of acrylic or oil. Every sculptor must confront the actual brittleness of their stone or the flexibility of their metal. Every dancer experiences the limits of muscle and sinew as part of the language of choreography. Fundamentally, both art and science are about encounters with the real world — the one we live in and experience as colors, textures, shapes and sounds. Every artistic creation and every scientific study is a record of experimentation. At their best those experiments are rooted in two vital qualities: interest and attention. As I wrote last week, interest and attention allow us to rise above stultifying boredom. Interest and attention allow us to live lives that are rich in meaning, lives that are passionate about noticing the everyday miracles right in front of us. No wonder, then, that both science and art have such power over us. No wonder that both seem to define the qualities that make us human. One of the great ironies of human existence is that art and science are both optional costs for culture. You don't have to put any money in to them if you think they are not worth it. And yet, the only cultures we remember, the only ones that matter across the long march of history, are those who did think they mattered. From the Hellenistic Greeks to the genius of the Renaissance, art and science have forever been paired together as the lasting expressions of truly great societies. Woe be unto those who forget that lesson.